Vermont’s economy is growing but not in every county, and its gains have disproportionately benefited higher income Vermonters, according to the 2018 update of “State of Working Vermont” from Public Assets Institute. 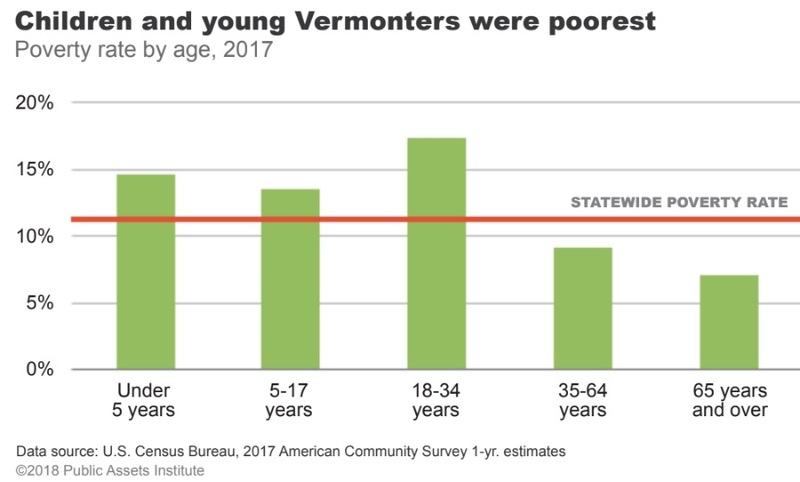 Poverty is distinctly more prevalent among younger Vermonters and Vermonters of color, the report notes. The northwestern part of the state accounted for all job growth in Vermont in the last decade, according to the Public Assets Institute report. While employment grew in Chittenden, Franklin and Washington counties, the remaining counties lost 15,000 workers. Why are income trends so important for affordable housing programs? Housing is affordable when income and housing costs are balanced. Housing with associated costs that consume no more than 30% of a household’s income is typically considered “affordable.” It is this connection that makes understanding the income side of the scale critical to most effectively building communities where residents have affordable housing. The report finds that in 2017, nearly two-thirds of Vermont households with incomes under $50,000 were living in unaffordable housing. Earlier this week, VHFA Executive Director Sarah Carpenter was honored by the VHFA Board of Commissioners with a resolution in recognition of her 20 years of service as head of the agency. L. Randolph Amis, Chair of Board of Directors, praised Carpenter for her “grace, good humor, and dogged resolution” in her leadership of VHFA and her advocacy for affordable housing. NOW, THEREFORE, BE IT RESOLVED, that the VHFA Board of Commissioners thanks Sarah for her extraordinary dedication and leadership and declares Sarah a friend of great distinction for Vermont’s affordable housing community and wishes here great joy and wonderful travel in her retirement. The Vermont Chamber of Commerce recently named Leo O’Brien Jr. and Daniel J. O’Brien, founder of O’Brien Brothers real estate development, as the 2018 Citizens of the Year. Among their many other accomplishments, the brothers have a long history of investment in affordable housing in Vermont. In the late 1970's, O’Brien Brothers was one of the first real estate developers to participate in the Section 8 program offered by the federal government through VHFA. At that time, the program was new, complicated, and considered risky by many. Country Park was one of the first projects built by the company with VHFA as a partner. The South Burlington affordable apartment complex continues to serve very low income seniors today. The O’Brien brothers are responsible for much of the Burlington area’s affordable rental housing stock. As the company more recently shifted some of their development interest to workforce housing and decided to sell some of their affordable properties, they worked very closely with VHFA to responsibly transition those properties to owners to ensure long term affordability and protection of the residents who lived there. Carpenter has worked in affordable housing management throughout her career. Prior to her role as Executive Director of VHFA, she led Cathedral Square Corporation as its Executive Director for 15 years and worked with the Champlain Valley Agency on Aging on housing issues. Sarah was a founding member of VHMA and has served in a variety of roles, including President and Treasurer. VHMA supports a network of affordable housing management organizations across Vermont, offering advanced training about current regulations and best practices for housing service providers. VHFA works closely with housing managers as part of its responsibility to provide oversight to state and federally funded housing developments. VHFA monitors housing projects for financial viability, property maintenance, program compliance, and long-term affordability. All proceeds from the auction will go directly to the United Way of Northwest Vermont whose mission is to build a stronger Northwest Vermont by mobilizing our community to improve people’s lives. United Way brings together individuals, nonprofits, businesses, and government entities to fight for the education, financial stability and health of every person in Chittenden, Franklin and Grand Isle counties. Now it is time to bid! The auction closes at 4:00 pm on Monday, December 17th.